This article is about the Wehrmacht tank destroyer. For the animal, see elephant. For other uses, see Elefant (disambiguation). The United States Army Ordnance Museum's restored Elefant. In January to April 1944, Ferdinands received modifications and upgrades. They were renamed Elefant in May 1944. The official German designation was Panzerjäger Tiger (P)[Note 1] and the ordnance inventory designation was Sd.Kfz. 184. 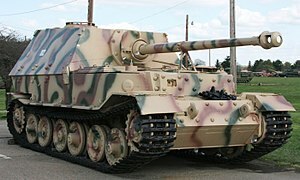 Porsche GmbH had manufactured about 100 chassis for their unsuccessful proposal for the Tiger tank, the "Porsche Tiger", in the Nibelungenwerk factory in Sankt Valentin, Austria. Both the successful Henschel proposal and the Porsche design used the same Krupp-designed turret—the Henschel design had its turret more-or-less centrally located on its hull, while the Porsche design placed the turret much closer to the front of the superstructure. Since the competing Henschel Tiger design was chosen for production, the Porsche chassis were no longer required for the Tiger tank project. It was therefore decided that the Porsche chassis were to be used as the basis of a new heavy panzerjäger, Ferdinand, mounting Krupp's newly developed 88 mm (3.5 in) Panzerjägerkanone 43/2 (PaK 43) anti-tank gun. This precise long-range weapon was intended to destroy enemy tanks before they came within their own range of effective fire. The Ferdinand was intended to supplant previous light panzerjägers, such as the Marder II and Marder III, in the offensive role. A similar gun was used in the lightly armored Hornisse (later known as Nashorn) tank destroyer, built at the same time. The petrol-electric transmission made it much easier to relocate the engines than would be the case on a mechanical-transmission vehicle (the engines can be mounted anywhere, and only the length of the power cables needs to be altered, as opposed to re-designing the driveshafts and locating the engines for the easiest routing of powershafts to the gearbox), so without the forward-mounted turret of the Porsche Tiger prototype, the twin engines were relocated to the front, where the turret had been, leaving room ahead of them for the now-isolated driver and assistant-driver only. The now empty rear half of the hull was covered with a heavily armored, full five-sided casemate with slightly-sloped upper faces and armored solid roof, and turned into a crew compartment, mounting a single 8.8 cm Pak 43 cannon in the forward face of the casemate. The initial Ferdinand conversions were thus among the first physical examples of what became known as the dedicated Jagdpanzer tank destroyers, all of which had completely enclosed casemates, but which were all designed to have their casemate-form armored enclosures designed as a much more integral component of the vehicle's hull armor from the start; the Ferdinand was more of a cross between the earlier, thinly armored, high-profile, "three-side" (open-top/rear) Panzerjäger and the later, more heavily armored, lower-profile, rear-engined Jagdpanzer. The driver and assistant driver were in a separate compartment at the front. As the engines were placed in the middle, the assistant driver and the driver were isolated from the rest of the crew and could be addressed only by intercom. Add-on armor of 100 mm was bolted to the front plates, increasing the plate's thickness to 200 mm and adding another 5 tons of weight. The preserved American-captured Elefant, showing the suspension it shared with the VK 4501 (P) chassis. The two Porsche air-cooled engines in each vehicle were replaced by two 300 PS (296 hp; 221 kW) Maybach HL120 TRM engines. The engines drove a single Siemens-Schuckert 500 VA generator each, which powered two Siemens 230 kW (312.7 PS) individual-output electric motors, one each connected to each of the rear sprockets. The electric motors also acted as the vehicle's steering unit. This "petrol-electrical" drive delivered 0.11 km/l (909 litres/100 km) off-road and 0.15 km/l (667 litres/100 km) on road at a maximum speed of 10 km/h off-road and 30 km/h on road. In addition to this high fuel consumption and poor performance, the vehicle was maintenance-intensive; the sprockets needed to be changed every 500 km. Porsche had experience of this form of petrol-electric transmission extending back to 1901, when he designed a car that used it. Suspension for the "slack track" equipped Ferdinand consisted of six twin bogies (three per side) with longitudinal torsion bars, without any overlapping wheels or return rollers. There are sprockets at both ends of the vehicle. The drive sprockets are at the rear, while the front pair contain a drum brake system. The vehicle was fitted with an 88 mm Panzerjägerkanone 43/2 gun (early designation 8,8 cm Stu.K. 43/1). This 71 caliber-long gun had originally been developed as a replacement for the 88 mm anti-aircraft gun that had been used against Allied tanks in the Western Desert Campaign and on the Eastern Front. It had a much longer barrel than the L/56 guns, which gave it a higher muzzle velocity, and fired a different, longer cartridge. These improvements gave the 88 mm L/71 significantly improved armor penetration ability over the earlier 88 mm. Although it lost the competition to the 8.8 cm Flak 41 and never became an anti-aircraft weapon, it was turned into the very successful Pak 43 anti-tank gun. As fitted, the gun was capable of 25° traverse and a similarly limited elevation. Ninety-one existing "Porsche Tiger" chassis were converted (chassis number 150010 to 150100). The work was completed in just a few months from March to May 1943. Three Bergepanzer Ferdinands (the recovery vehicle variant of the Ferdinand tank destroyer) were produced at the Nibelungenwerke in summer 1943. A disabled Elefant in Italy, 1944. Ferdinands first saw combat in the Battle of Kursk, where eighty-nine were committed, the largest deployment of the vehicle during its service. The Ferdinand was optimized for destroying Soviet T-34 tanks and 76.2 mm anti-tank guns from behind the front lines with its 88 mm Pak 43/2 L/71 at a range of over 3 kilometres, a role which it performed well. Its most significant problem at Kursk was mine damage and mechanical failure. Any damage to the tracks or suspension negated the protection of the armor, as crews were forced to dismount and attempt repairs. The extremely heavy weight of the Ferdinand made towing difficult: the standard armored recovery vehicle in German service at the time was the Bergepanzer IV, a variant of the Panzer IV that could tow a single Panzer IV without assistance. It was insufficient for larger vehicles, with a Tiger I heavy tank requiring three Bergepanzer IVs to be towed, and the Ferdinand requiring five linked in tandem to pull the vehicle off the field. In addition, the Ferdinand was hampered by flaws such as the lack of peripheral vision blocks, or a machine gun as secondary defensive armament. Apocryphal reports say that Soviet infantry, quickly recognizing this flaw, could easily hide in their trenches until the Ferdinand advanced through their lines, then swarm the vehicle with grenades and Molotov cocktails from the sides. However, losses to Soviet infantry are disputed in after-action reports. In the initial stages of the Kursk battle, when the Germans were on the offensive, heavy vehicles could be recovered and repaired with relative peace at night; this at first allowed the majority of knocked-out Ferdinands to be rescued, repaired and returned to duty. 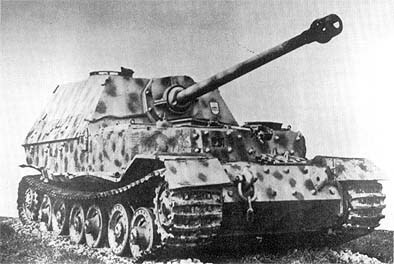 However, once the tides had turned against the Germans and they fell back on the defensive, with fewer vehicles to spare, functional Ferdinands with minor damage to their tracks or suspensions had little hope of recovery, and crews were usually forced to destroy the vehicle to prevent a mostly intact Jagdpanzer from falling into the hands of the Soviets. The surviving Ferdinands fought various rear-guard actions in 1943 until they were recalled to be modified and overhauled, partially based on battle experience gained in the Battle of Kursk. Returned to the Nibelungenwerke factory in Austria, on 02 January 1944, upgrades commenced on 48 of the 50 surviving vehicles. The most visible exterior upgrades were 1) the addition of a ball-mounted MG 34 in the hull front, 2) a new commander's cupola (modified from the standard StuG III cupola) for improved vision, 3) re-designed armored engine grates (for better bullet and shrapnel protection) and 4) the application of Zimmerit anti-magnetic mine paste. Due to the Allied landing in Anzio-Nettuno, Italy, the first eleven complete and updated Ferdinands were issued to the 1st company of 653rd Heavy Tank Destroyer Battalion (German: schwere Panzerjäger-Abteilung, sPzJgrAbt) and were deployed at the end of February 1944. The remaining 37 vehicles were completed in April and were issued to the 2nd and 3rd companies of sPzJgrAbt 653 which boarded trains and sent to the Tarnopol battles in Ukraine. 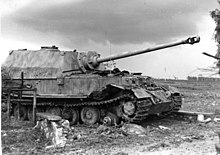 On 01 May 1944, German Army High Command, Oberkommando des Heeres (OKH) issued an order to formally change the panzerjäger's name from "Ferdinand" to "Elefant". This order forbade future use of Ferdinand and even directed units in the field to edit their records. This is contrary to popular belief that the name change was linked to the January–April mechanical upgrades to the Ferdinand panzerjäger; the name change was purely administrative in nature. Three Bergepanzer Elefant or armoured recovery vehicles were converted from Ferdinand/Elefant hulls and issued with the 2nd and 3rd companies of sPzJgrAbt 653 to the East in the summer of 1944. Although the Elefant modifications improved the vehicles, some problems could never be fully fixed. In 1944, the Ferdinand/Elefants served on the Italian front, but were rather ineffective as their weight of nearly 70 tonnes did not allow them to use most Italian roads and bridges. As at Kursk, most Elefant losses were not as a direct result from combat, but resulted when mechanical breakdowns and lack of spare parts compelled their crews to destroy and abandon them. One company of Elefants saw action during the Soviets' January 1945 Vistula-Oder offensive in Poland, and the very last surviving vehicles were in combat at Zossen during the Battle of Berlin. The Ferdinand/Elefant may have been the most successful tank destroyer employed during the war in kills per loss, reaching an average claimed ratio of approximately 10:1. During the Battle of Kursk, sPzJgrAbt 653 claimed to have knocked out 320 enemy tanks, for the loss of 13 Ferdinands. This impressive average ratio was due to its extreme firepower and protection, which gave it an enormous advantage when used in head-on combat or a static defensive role (however note that claimed tank kills are well-proven to invariably greatly exceed actual kills, and different organizations have different standards of defining a 'kill'). However, poor mobility and mechanical unreliability greatly diminished its operational capability. The Elefant and Nashorn were both superseded by the Jagdpanther. All three vehicles mounted the same gun, with only some minor differences between them. The Jagdpanther - a true jagdpanzer - was a successor to the other two, combining acceptable mobility and good, sloped armour while retaining the excellent gun, mostly solving the reliability, mobility, and/or protection problems that the earlier vehicles had. Only two of these vehicles survived the war. One Ferdinand was captured by Soviet forces at Kursk, and is now at the Kubinka Tank Museum outside Moscow. An Elefant, numbered "102" of sPzJgr Abt 653, was captured at Anzio by the Americans, and is now part of the United States Army Ordnance Museum's collection at Fort Lee, VA. The example at Fort Lee was restored to display condition in 2007–2008, as documented on the show Tank Overhaul, but not in its original paint scheme. It was announced in 2016 that the Fort Lee Elefant would be loaned to the Bovington Tank Museum in Dorset, UK. The vehicle was displayed as part of the museum's "Tiger Collection" display from April 2017 until January 2019, when it was returned to the United States. This display brought all the members of the Tiger family together in one place for the first time. The Kubinka Tank Museum's Ferdinand. SU-152, a Soviet self-propelled heavy howitzer which earned the nickname Zveroboy ("beast killer") for its ability to knock out Elefants, as well as Tigers and Panther tanks. ^ a b D 2030 – 8,8 cm Panzerjägerkanone 43/2 (L/71), Beschreibung, 28.1.1944. Berlin. ^ Jentz, Thomas. Panzer Tracts No. 9 - Jagdpanzer 38 to Jagdtiger. Darlington Productions, Inc. p. 41. ISBN 0-9648793-3-6. ^ a b "Tank Destroyer Elefant". Germandressdaggers.com. Retrieved 2017-08-18. ^ "Ferdinand/Elephant". Achtung Panzer!. Retrieved 2010-02-07. ^ "Richmond Times Dispatch". Archived from the original on 2013-02-04. Retrieved 2011-04-07. ^ "Picture of the Army Ordance Museums Elefant when captured (can be recognized by the impacts on the gun and on the left front wheel)". Archived from the original on 2016-03-04. ^ "In a world first, The Tank Museum is planning an exhibition that will bring every member of the Tiger Tank family together in one display". Tankmuseum.org. Retrieved 2017-08-18. Wikimedia Commons has media related to Panzerjäger Tiger (P).